Glowing skin is such a striking madness women chase after with a plethora of skincare and makeup products. And, I’m also one of them. Harsh external “meanies” can attack our skin anytime and break down its’ lipid barrier function carrying emollient, which is responsible for soft, smooth sensation. Then, skin’s lubricating genes tends to atrophy. That can drive skin exhausted and turn out being dull and saggy. At the moment, there are two miracle performing moisturizers I’m holding close. And, haven’t intended to give up yet. 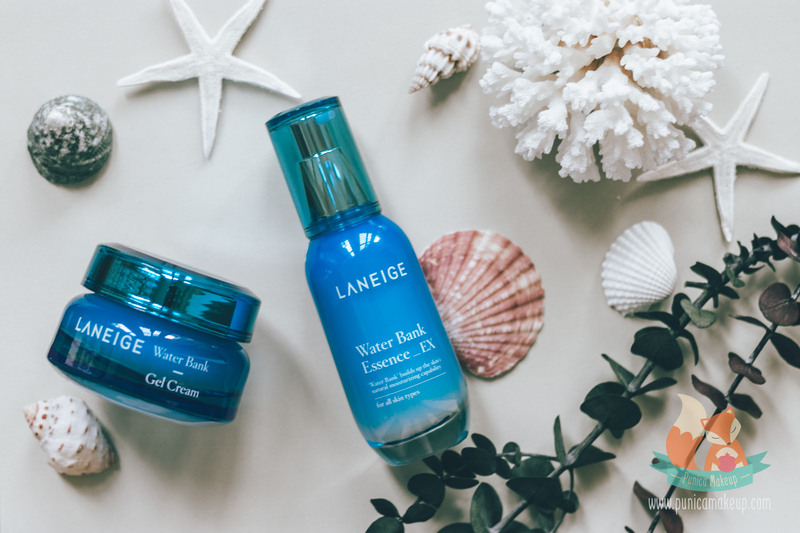 Laneige is really genius to create countless skincare products infused with the water science that astoundingly hydrates skin. 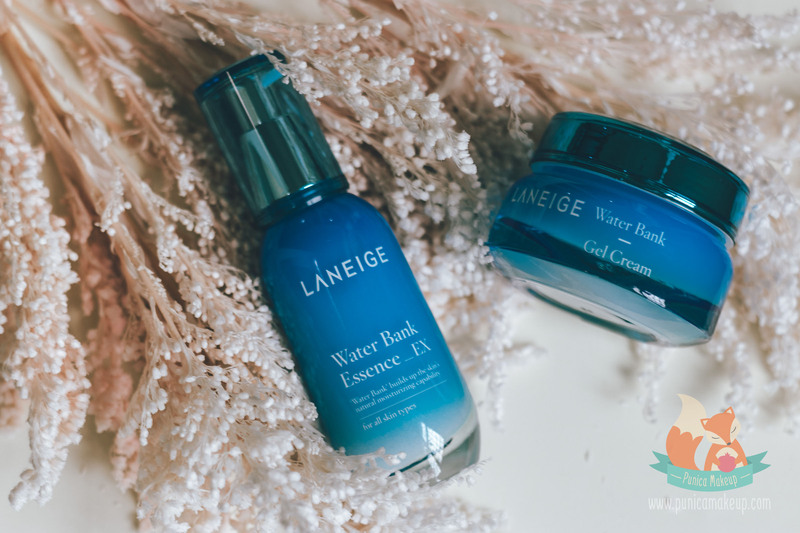 This time I want to share my frank review of the Laneige Water Bank Essence Ex first. Then, the second one is Water Bank Gel Cream that will be later. These two are just gifted, genuinely amazing when working together for my skin’s sake. Let’s dive right in the Essence’s formulation, dollies! The moisturizing content majorly stems from the Hydro Ion Mineral Water derived from the nutrient-rich Chenopodium Quinoa Seed as a result of the past 7 thousand year cultivation. So, the tiny ionized minerals are able to penetrate quickly and deeply through skin layers. That’s inclined to effectively awaken the sluggish moisture producing system of dry skin. After that, make skin stay hydrated for the whole day. Moreover, packed with an enormous vitamins, proteins and amino acids of the superfood Quinoa as the Mother Grain. Its’ extract delivers extraordinary nourishment that tremendously moisturizes and soothes skin with age-defying and healing properties. Then, this tends to beat the dryness up and swiftly get your complexion back at the balance point for a healthy, supple look. The product also contains olive oil, which is abundant in oleic acid to vigorously strengthen natural emollient of the epidermis. Simultaneously, it provides anti-inflammatory effect that alleviate the irritation and itchiness caused by the severe flakiness. 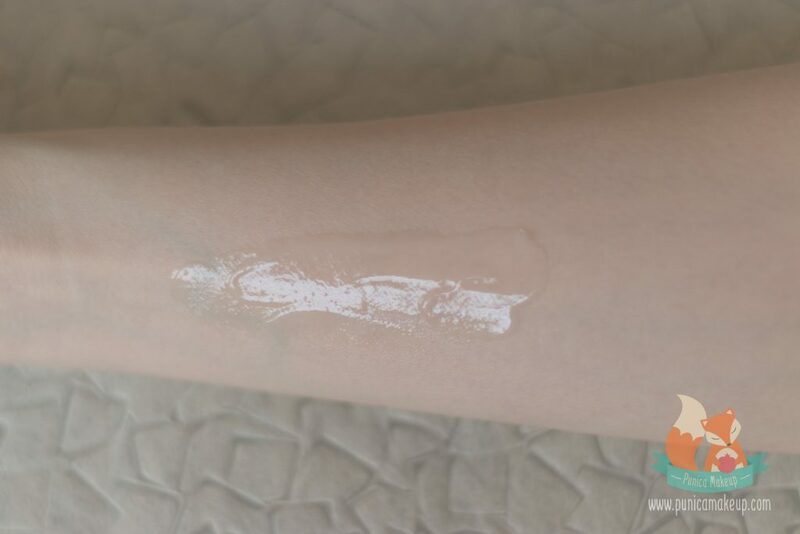 There are included botanical extracts of Tillandsia Usneoides, Salix Alba (White Willow) Bark and Ceratonia Siliqua (Carob) Fruit and Limnanthes Alba (Meadowfoam) Seed. They do their jobs as conditioning agents to improve skin texture and reduce rough patches. Our story hasn’t ended yet. In addition to boost skin hydration, the essence is meant to reinforce skin’s protective barrier and arouse cellular turnover for a velvety, soft sensation. It’s proven to diminish the appearance of damaged, dead cells clustered onto the stratum corneum and encourage skin’s nutrient absorption. The product was the beauty award winner in 2015, you can’t help falling in love with it. This is a mighty enemy against dry, flaky culprits. Plus, the recipe consists of many chemical compounds to ensure the essence’s stability and preservation. Oh, and it does have fragrance. 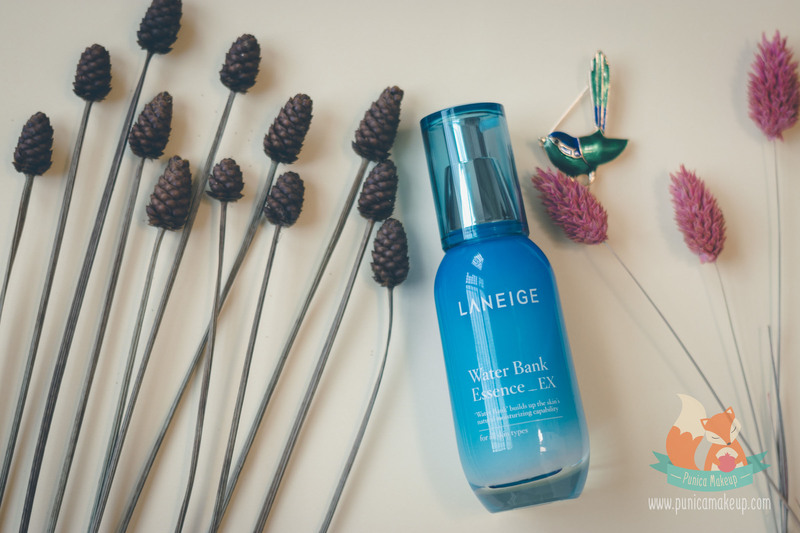 Before giving details how the Laneige Water Bank Essence_Ex has made changes onto my skin, gotta say this is one of the holy grails that I’ve ever known. The fluid is extremely thin and lightweight as well as gel-like with very low viscosity and a pale, milky color. So, there is no need to warm it up between hand palms to decrease the thickness, instead, I can directly take little drops onto my skin. When applying by merely three fingers, the gel is like spreading evenly and widely without effort. Also, it promptly sinks down into skin and doesn’t leave stubborn sticky, greasy feelings on the surface. I mean it may be slightly wet at the first few seconds, but absolutely, there aren’t excessive oily traces or overwhelming shine upon my face, especially T-zone area. I have a type of combination, prone to dry skin usually getting reddened and pimples around cheeks. Breakout is at least once a month. One thing I can be pretty sure that there is no way the essence will cause clogged pores or aggravate acne vulgaris. Except, you haven’t been taking care of your skin properly, for example, not remove all of impurities prior to moisturizing. The product is really safe and gentle, literally like water once blending all over my face, I find quenching my skin thirst. One month ago, it was pathetically dull and tight, especially after cleansing, with roughness and minor blemishes. I thought my skin couldn’t improve by chance, the situation kept dragging me down. 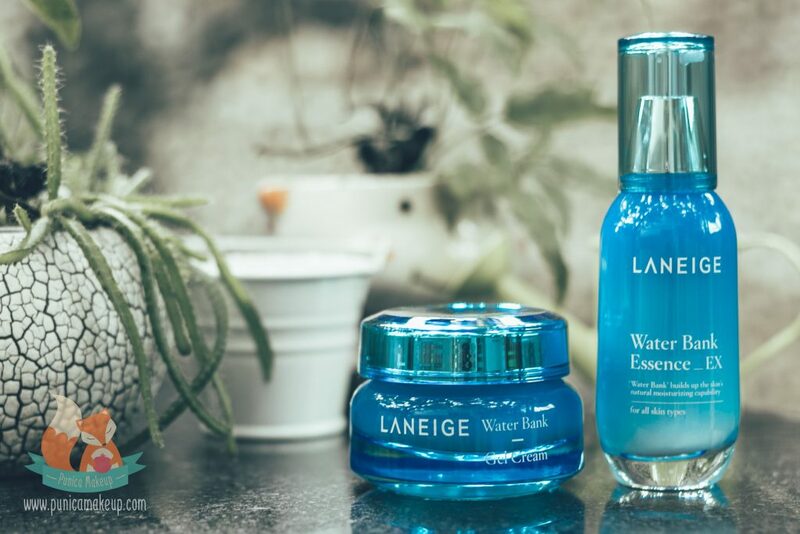 Then, the Laneige Water Bank popped out in my head. To avoid unexpected allergic reactions, I decided to use the Essence_Ex with the Gel Cream for the morning only. Within 3 weeks, my skin starts improving visibly, the dry, scaly patches seem gradually gone. Very hydrating and soothing I can tell. The product doesn’t worsen off lumps and cysts, the acnes are on the way to reduce. It’s inclined to smooth out and plump up skin texture as well as revitalize natural luminosity upon. My complexion is getting better with lively, radiant appearance, so I’m really grateful for that, looking forward to seeing more improvements. For normal, combination, sensitive and particularly, dry skins, the serum is literally go-to. Its’ moisturizing content certainly provides water to the outermost layer that all skins need rather than adds up oil or sebum, some of us may be mistaken about. This tends to penetrate deeply into skin layers and balance out the operation of sebaceous glands. I think it’s also suitable for oily skins which are more likely to be dehydrated. Dehydration can result in skin’s imbalance and hence, make a false signal to arouse overactive sebum production in place of the loss of water as an alternative lubricating factor. That brings about unbreathable, blocked pores and swelling. My mom has been utilizing the essence as well and her skin loves it. She said it was genuinely cooling and relaxing to quickly dampen the tight feeling without tacky residue. I highly recommend using cream or emulsion following the essence. The product is fine to vitally impact on the root of problems beneath skin layers to trigger skin regeneration. However, not able to utterly lock skin in moisture and protect from environmental stressors whilst heading outdoor. Definitely, apply one more layer of moisturizing cream on top for an ultimate replenishment, dollies! Currently, I’m in the comfort zone with the Water Bank Essence_Ex and the Gel Cream going after. Otherwise, the serum is not something good for those who have chronic conditions such as eczema and rosacea. Its’ fast absorption can provoke irritation to them. Additionally, the product does have a floral scent which is nice and not overpowering. Regard to its’ packaging design, I’m totally digging into it. The serum comes to a ocean blue glass bottle. It looks so pure and lovable with a pump from which you can easily control the amount you want to take out. The bottle is really sanitary and doesn’t let the fluid smear around or spill out. It looks deluxe to me so I tried taking nice pictures as much as I could to embrace how beautiful it was. Moreover, the bottle is quite heavy and not comfortable to carry around when travelling. The product is a promising solution for most of skin types to fight against dryness, flakiness and dehydration. And, it deserves your attention to try it out. I love all about it so I’m gonna give it 8 out of 10. 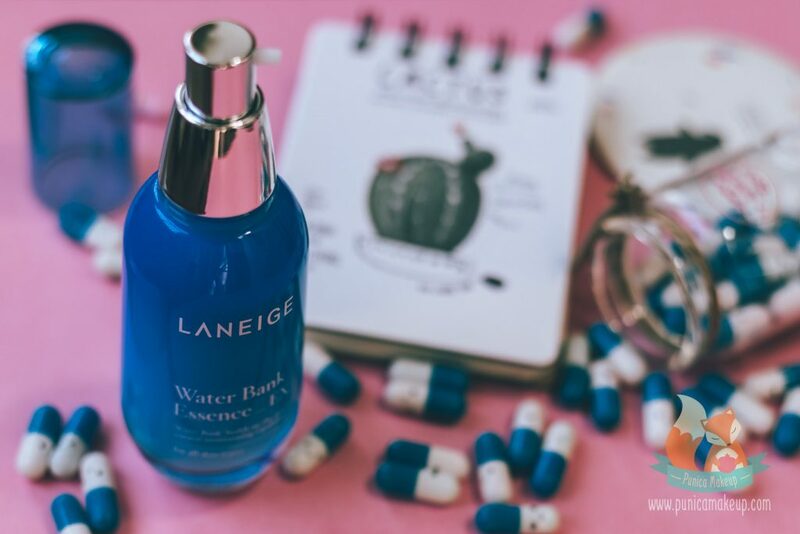 Hope the post is informative and useful enough for those who have interest about the Laneige Water Bank Essence_Ex. If you have any questions or ideas, please be open with me. I’d love to hear you out and appreciate that. Thank you so much for spending time with us!